Today Satan is attempting to invade our military and some of our ‘spineless’ military leaders are letting it happen or are complicit in that attack. I look back on the days of combat and cannot remember a single serviceman asking for an ‘atheist’ in time of peril. None the less there are those who believe that Christianity and its principles have no place in the military…’shame on George Washington!’. Religious liberty is our first freedom and if we allow the secularists to undermine that specific freedom everything else will crumble. It was God’s Word that gave us the principles and words that our Constitution was built around. Today one does not have to look far to see cracks in the foundation. The US Department of Defense (DoD) in 2015 published a “sexism course” that attacked the Bible, the US Constitution, and the Declaration of Independence. The DoD said all three contributed to modern sexism. [Jessica Chasmar,”Pentagon Training Course Says Modern Sexism Rooted in the Bible, Constitution”, The Washington Times, LLC, April 14, 2015]. Previously, in 2013, the DoD published a training document that depicted the Founding Fathers as extremists, and conservative organizations as hate groups. This was a training guide used by the Defense Equal Opportunity Management Institute but it originated with the Pentagon. Yes, this was the United States Pentagon, not China, Russia, Iran, or North Korea. It would appear that Congress needs to conduct better oversight and figure out what the heck is going on in our military? In the 133 pages of lesson plans is a student guide titled “Extremism”. A section under this subject is a subsection titled “Extremist Ideologies”. Therein the document states,”In US history there are many examples of extremist ideologies and movements. The colonist who sought to free themselves from British rule and the Confederate states who sought to secede from the Northern states are just two examples.” [“AFSS 0910 Equal Opportunity and Treatment Incidents (EOTI)”, Defense Equal Opportunity Management Institute, January 2013]. It was a disturbing insight as to what was happening inside the previous administration’s Pentagon. That administration had a nasty habit of equating basic conservative values with terrorism. The training guide warned that active participation in groups that are regarded as extremist organizations is “incompatible with military service and is, therefore, prohibited.” [Ibid]. Does your evangelistic church disqualify members of the congregation from serving in the military? This training document focuses on those who cherish individual liberty. The DoD warns students to be aware that “nowadays, instead of dressing in sheets or publicly espousing hate messages, many extremists will talk of individual liberties, states’ rights, and how to make the world a better place. [Ibid]. It’s political correctness run amok! The document relied heavily on information obtained from the Southern Poverty Law Center, a left-wing organization that has a history of labeling conservative Christian organizations such as the Family Research Council (FRC) as ‘hate groups’. With that kind of recommendation I will have to make sure I send FRC a donation this month. In April 2013 an e-mail was obtained that had been sent by a lieutenant colonel at Fort Campbell to three dozen subordinates warning them to be on the outlook for any soldiers who might be members of “domestic hate groups” such as Family Research Center (FRC) and the American Family Association…another donation this month. [Todd Starnes,”US Army Defines Christian Ministry as Domestic Hate Group”, FoxNews.com, October 14, 2013]. (In my 29 years in the military I never once felt compelled to send out such a communique. We looked to our chaplains as moral and spiritual leaders.) At the time the Army denied there was any attack on Christians or those who hold religious beliefs. But it does make one wonder what the past administration’s minions at the Pentagon were up to. In a separate incident an Army training instructor listed evangelical Christianity and Catholicism as examples of religious extremism…along with al Qaeda and Hamas. It’s at least a good thing the DoD hasn’t resorted to slandering our Founding Fathers or the Declaration of Independence because in 2016 Rep. Barbara Norton managed to do both during a bizarre rant on the floor of the Chambre des Representants de Louisiane. As she stated,”All men are not created equal”, she ranted. “We’re teaching them a lie”. [Susan Berry,”State Representatives Attack Declaration of Independence on Louisiana House Floor”, Breitbart, May 27, 2016]. She was fired up and hotter than a bottle of Tabasco sauce. Why can’t those who love this nation do the same? What we have here is a nation that has lost its steerage way and is rudderless. When a nation looses its guiding principles then any ole principle will do. Next week we will see how some of our government ‘servants’ are they themselves trying to tear down the foundations of this nation while many of our churches just sit back and watch. Once again the silence is deafening. Are our future generations going to be led by God’s Word and the church or the “Pied Piper” of secular pleasure and self centeredness? 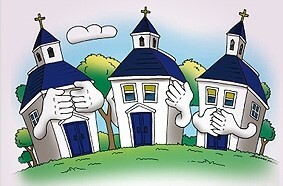 Where is your church in the conflict?